Mother, Baby and Toddler offers everything for mums-to-be and new mums on the coast – from midwifery services, choosing where to have your baby, baby and childrenÂ´s health issues, purchasing all the essential items, activities for pregnant mums and babies, decorating the nursery, buying clothes and toys, choosing a nursery, a school, nutritional and developmental help and support plus information on myriad other topics. Mother, Baby & Toddler is a one-stop-shop for expectant mums and young families, a place to come to find out everything you need to know about how to raise a healthy, happy and confident child. 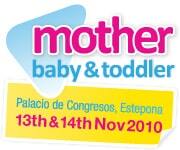 Mother, Baby and Toddler has a fantastic prize draw for a Family Fun Pack worth 500â‚¬ plus lots of other prizes! As a visitor you will automatically be entered. There will be loads of entertainment, singing, dancing, a maternity and toddler fashion show, workshops and seminars, an All About Mum zone, and childrenÂ´s soft play area with entertainment for the little ones. A great day out for the whole family – tickets cost â‚¬3 on the door, but you can attend for FREE when you register in advance – Go to the Mother, Baby & Toddler website for your free tickets.